In the lower chart, we show the 10-day rate of change of high yield spreads over time. At their peak back on 1/3, spreads had seen the largest 10-day move wider since early 2018 (98 bps). Ten trading days later, we are now looking at the largest narrowing move in spreads since July 2016. Unlike the current period, the narrowing of spreads in July 2016 did not immediately follow a 10-day move where spreads widened significantly. 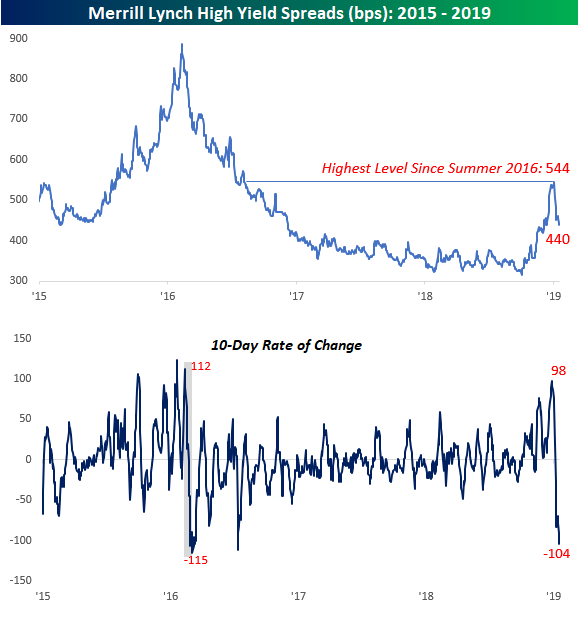 To find a period where this large of a move immediately followed a ten-day period where investors couldn’t exit high yield fast enough (wider spreads), you have to go back to that period in February 2016 that was marked by the ‘Dimon Bottom”. Now, if only the market follows a similar path moving forward!